The prime minister announced that Chennai Central Station would be renamed after MG Ramanathan (MGR), the former chief minister of the state and the founder of AIADMK, with whom the BJP recently formed an alliance. He said that the Central government was devoted to developing ‘a Tamil Nadu that Amma Jayalalitha dreamt of’. He also unveiled several road and railway projects worth crores of rupees in the state that would reduce carbon footprint and cut down on travel time. 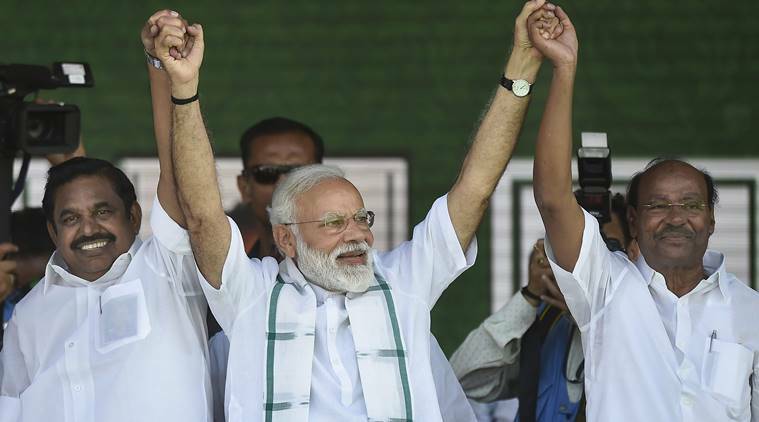 Earlier in the day, during a rally in Karnataka’s Kalaburagi, the prime minister took on the Opposition parties as he ridiculed their efforts to form an anti-BJP alliance as “politics of selfishness”. He said they were guided solely by the agenda of “Modi hataao”. He urged people of Karnataka to elect a full-majority government in the coming Lok Sabha election, stressing that a “mahamilavat” (highly adulterated) dispensation would deliver half results. While asserting that the development plank was high on the agenda of his government, he launched a slew of projects in the state. Modi called Karnataka Chief Minister H D Kumaraswamy a “remote-controlled CM,” alleging he was being dictated by the Congress. “Karnataka is in a bad state. Can we allow the state of the country to get bad too,” he asked the crowd at the rally. The PM also attacked Congress for dismissing the MGR government in 1980. He said the Congress leadership had repeatedly invoked Article 356 to dismiss state governments heading by regional party heads that were not in tune with them. “In fact, fifty state government were dismissed by Indira ji (the then prime minister Indira Gandhi) as she invoked Article 356)”. Meanwhile, DMDK skipped the prime minister’s rally in Kanchipuram. LK Sudeesh, the deputy general secretary of DMDK said as they still continue their talks with BJP, a decision will be announced in a day or two.